The tell includes two phases of use, believed to be of a social or ritual nature by site discoverer and excavator Klaus Schmidt, dating back to the 10th–8th millennium BCE. During the first phase, belonging to the Pre-Pottery Neolithic A (PPNA), circles of massive T-shaped stone pillars were erected – the world's oldest known megaliths. More than 200 pillars in about 20 circles are currently known through geophysical surveys. Each pillar has a height of up to 6 m (20 ft) and weighs up to 10 tons. They are fitted into sockets that were hewn out of the bedrock. In the second phase, belonging to the Pre-Pottery Neolithic B (PPNB), the erected pillars are smaller and stood in rectangular rooms with floors of polished lime. The site was abandoned after the PPNB. Younger structures date to classical times. The site was first noted in a survey conducted by Istanbul University and the University of Chicago in 1963. American archaeologist Peter Benedict identified lithics collected from the surface of the site as belonging to the Aceramic Neolithic, but mistook stone slabs (the upper parts of the T-shaped pillars) for grave markers, postulating that the prehistoric phase was overlain by a Byzantine cemetery. The hill had long been under agricultural cultivation, and generations of local inhabitants had frequently moved rocks and placed them in clearance piles, which may have disturbed the upper layers of the site. At some point attempts had been made to break up some of the pillars, presumably by farmers who mistook them for ordinary large rocks. The Hd samples are from charcoal in the fill of the lowest levels of the site and would date the end of the active phase of occupation of Level III - the actual structures will be older. The Ua samples come from pedogenic carbonate coatings on pillars and only indicate the time after the site was abandoned—the terminus ante quem. Göbekli Tepe is on a flat and barren plateau, with buildings fanning in all directions. In the north, the plateau is connected to a neighbouring mountain range by a narrow promontory. In all other directions, the ridge descends steeply into slopes and steep cliffs. On top of the ridge there is considerable evidence of human impact, in addition to the construction of the tell. Excavations have taken place at the southern slope of the tell, south and west of a mulberry that marks an Islamic pilgrimage, but archaeological finds come from the entire plateau. The team has also found many remains of tools. The plateau has been transformed by erosion and by quarrying, which took place not only in the Neolithic, but also in classical times. There are four 10-metre-long (33 ft) and 20-centimetre-wide (7.9 in) channels on the southern part of the plateau, interpreted as the remains of an ancient quarry from which rectangular blocks were taken. These possibly are related to a square building in the neighbourhood, of which only the foundation is preserved. Presumably, this is the remains of a Roman watchtower that belonged to the Limes Arabicus, however, this is conjecture. Most structures on the plateau seem to be the result of Neolithic quarrying, with the quarries being used as sources for the huge, monolithic architectural elements. Their profiles were pecked into the rock, with the detached blocks then levered out of the rock bank. Several quarries where round workpieces had been produced were identified. Their status as quarries was confirmed by the find of a 3-by-3-metre piece at the southeastern slope of the plateau. Unequivocally Neolithic are three T-shaped pillars that had not yet been levered out of the bedrock. The largest of them lies on the northern plateau. It has a length of 7 m (23 ft) and its head has a width of 3 m (10 ft). Its weight may be around 50 tons. The two other unfinished pillars lie on the southern Plateau. At the western edge of the hill, a lionlike figure was found. In this area, flint and limestone fragments occur more frequently. It was therefore suggested that this could have been some kind of sculpture workshop. It is unclear, on the other hand, how to classify three phallic depictions from the surface of the southern plateau. They are near the quarries of classical times, making their dating difficult. Apart from the tell, there is an incised platform with two sockets that could have held pillars, and a surrounding flat bench. This platform corresponds to the complexes from Layer III at the tell. Continuing the naming pattern, it is called "complex E." Owing to its similarity to the cult-buildings at Nevalı Çori it has also been called "Temple of the Rock." Its floor has been carefully hewn out of the bedrock and smoothed, reminiscent of the terrazzo floors of the younger complexes at Göbekli Tepe. Immediately northwest of this area are two cistern-like pits, believed to be part of complex E. One of these pits has a table-high pin as well as a staircase with five steps. Two taller pillars stand facing one another at the centre of each circle. Whether the circles were provided with a roof is uncertain. Stone benches designed for sitting are found in the interior. Many of the pillars are decorated with abstract, enigmatic pictograms and carved animal reliefs. The pictograms may represent commonly understood sacred symbols, as known from Neolithic cave paintings elsewhere. The reliefs depict mammals such as lions, bulls, boars, foxes, gazelles, and donkeys; snakes and other reptiles; arthropods such as insects and arachnids; and birds, particularly vultures. At the time the edifice was constructed, the surrounding country was likely to have been forested and capable of sustaining this variety of wildlife, before millennia of human settlement and cultivation led to the near–Dust Bowl conditions prevalent today. Vultures also feature prominently in the iconography of Çatalhöyük and Jericho. Few humanoid figures have appeared in the art at Göbekli Tepe. Some of the T-shaped pillars have human arms carved on their lower half, however, suggesting to site excavator Schmidt that they are intended to represent the bodies of stylized humans (or perhaps deities). Loincloths appear on the lower half of a few pillars. The horizontal stone slab on top is thought by Schmidt to symbolize shoulders, which suggests that the figures were left headless. Whether they were intended to serve as surrogate worshippers, symbolize venerated ancestors, or represent supernatural, anthropomorphic beings is not known. Some of the floors in this, the oldest, layer are made of terrazzo (burnt lime); others are bedrock from which pedestals to hold the large pair of central pillars were carved in high relief. Radiocarbon dating places the construction of these early circles in the range of 9600 to 8800 BCE. Carbon dating suggests that (for reasons unknown) the enclosures were backfilled during the Stone Age. Creation of the circular enclosures in layer III later gave way to the construction of small rectangular rooms in layer II. Rectangular buildings make a more efficient use of space compared with circular structures. They often are associated with the emergence of the Neolithic, but the T-shaped pillars, the main feature of the older enclosures, also are present here, indicating that the buildings of Layer II continued to serve the same function in the culture, presumably as sanctuaries. Layer II is assigned to Pre-Pottery Neolithic B (PPNB). The several adjoining rectangular, doorless and windowless rooms have floors of polished lime reminiscent of Roman terrazzo floors. Carbon dating has yielded dates between 8800 and 8000 BCE. Several T-pillars up to 1.5 meters tall occupy the center of the rooms. A pair decorated with fierce-looking lions is the rationale for the name "lion pillar building" by which their enclosure is known. 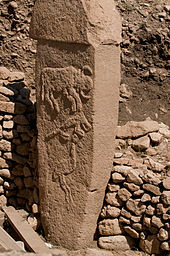 A stone pillar resembling totem pole designs was discovered at Göbekli Tepe, Layer II in 2010. It is 1.92 metres high, and is superficially reminiscent of the totem poles in North America. The pole features three figures, the uppermost depicting a predator, probably a bear, and below it a human-like shape. Because the statue is damaged, the interpretation is not entirely clear. Fragments of a similar pole also were discovered about 20 years ago in another Turkey site at Nevalı Çori. Also, an older layer at Gobekli features some related sculptures portraying animals on human heads. Layer I is the uppermost part of the hill. It is the shallowest, but accounts for the longest stretch of time. It consists of loose sediments caused by erosion and the virtually-uninterrupted use of the hill for agricultural purposes since it ceased to operate as a ceremonial center. The site was deliberately backfilled sometime after 8000 BCE: the buildings were buried under debris, mostly flint gravel, stone tools, and animal bones. In addition to Byblos points (weapon heads, such as arrowheads etc.) and numerous Nemrik points, Helwan-points, and Aswad-points dominate the backfill's lithic inventory. All statements about the site must be considered preliminary, as less than 5% of the site has been excavated, and Schmidt planned to leave much of it untouched to be explored by future generations when archaeological techniques will presumably have improved. While the site formally belongs to the earliest Neolithic (PPNA), to date no traces of domesticated plants or animals have been found. The inhabitants are presumed to have been hunters and gatherers who nevertheless lived in villages for at least part of the year. So far, very little evidence for residential use has been found. Through the radiocarbon method, the end of Layer III can be fixed at about 9000 BCE (see above), but it is believed[by whom?] that the elevated location may have functioned as a spiritual center during 11,000 BCE or even earlier, essentially, at the very end of the Pleistocene. The surviving structures, then, not only predate pottery, metallurgy, and the invention of writing or the wheel, but were built before the so-called Neolithic Revolution, that marks the beginning of agriculture and animal husbandry, around 9000 BCE. The construction of Göbekli Tepe implies organization of an advanced order not hitherto associated with Paleolithic, PPNA, or PPNB societies, however. Archaeologists estimate that up to 500 persons were required to extract the heavy pillars from local quarries and move them 100–500 meters (330–1,640 ft) to the site. The pillars weigh 10–20 metric tons (10–20 long tons; 11–22 short tons), with one still in the quarry weighing 50 tons. Around the beginning of the 8th millennium BCE Göbekli Tepe lost its importance. The advent of agriculture and animal husbandry brought new realities to human life in the area, and the "Stone-age zoo" (Schmidt's phrase applied particularly to Layer III, Enclosure D) apparently lost whatever significance it had had for the region's older, foraging communities. But the complex was not simply abandoned and forgotten to be gradually destroyed by the elements. Instead, each enclosure was buried quite deliberately under as much as 300 to 500 cubic meters (390 to 650 cu yd) of refuse, creating a tell consisting mainly of small limestone fragments, stone vessels, and stone tools. Many animal, and even human, bones have been identified in the fill. Why the enclosures were buried is unknown, but it preserved them for posterity. Schmidt's view was that Göbekli Tepe is a stone-age mountain sanctuary. Radiocarbon dating as well as comparative, stylistical analysis indicate that it is the oldest ceremonial site yet discovered anywhere. Schmidt believed that what he called this "cathedral on a hill" was a pilgrimage destination attracting worshippers up to 150 km (90 mi) distant. Butchered bones found in large numbers from local game such as deer, gazelle, pigs, and geese have been identified as refuse from food hunted and cooked or otherwise prepared for the congregants. Schmidt considered Göbekli Tepe a central location for a cult of the dead and that the carved animals are there to protect the dead. Though no tombs or graves have been found so far, Schmidt believed that they remain to be discovered in niches located behind the walls of the sacred circles. In 2017, discovery of human crania with incisions was reported, interpreted as providing evidence for a new form of Neolithic skull cult. Schmidt also interpreted the site in connection with the initial stages of the Neolithic. It is one of several sites in the vicinity of Karaca Dağ, an area that geneticists suspect may have been the original source of at least some of our cultivated grains (see Einkorn). Recent DNA analysis of modern domesticated wheat compared with wild wheat has shown that its DNA is closest in sequence to wild wheat found on Karaca Dağ 30 km (20 mi) away from the site, suggesting that this is where modern wheat was first domesticated. With its mountains catching the rain and a calcareous, porous bedrock creating lots of springs, creeks, and rivers, the upper reaches of the Euphrates and Tigris was a refuge during the dry and cold Younger Dryas climatic event (10,800 – 9,500 BCE). Speculation exists that conditions driven by population expansions locally could have led them to develop common rituals strengthened by monumental gathering places to reduce tensions and conflicts over resources, and probably, to mark territorial claims. Schmidt also engaged in speculation regarding the belief systems of the groups that created Göbekli Tepe, based on comparisons with other shrines and settlements. He presumed shamanic practices and suggested that the T-shaped pillars represent human forms, perhaps ancestors, whereas he saw a fully articulated belief in deities as not developing until later, in Mesopotamia, that was associated with extensive temples and palaces. This corresponds well with an ancient Sumerian belief that agriculture, animal husbandry, and weaving were brought to humans from the sacred mountain Ekur, which was inhabited by Annuna deities, very ancient deities without individual names. Schmidt identified this story as a primeval oriental myth that preserves a partial memory of the emerging Neolithic. It is apparent that the animal and other images give no indication of organized violence, i.e. there are no depictions of hunting raids or wounded animals, and the pillar carvings generally ignore game on which the society depended, such as deer, in favour of formidable creatures such as lions, snakes, spiders, and scorpions. Expanding on Schmidt's interpretation that round enclosures could represent sanctuaries, Gheorghiu's semiotic interpretation reads the Göbekli Tepe iconography as a cosmogonic map that would have related the local community to the surrounding landscape and the cosmos. Göbekli Tepe is regarded by some as an archaeological discovery of great importance since it could profoundly change the understanding of a crucial stage in the development of human society. Ian Hodder of Stanford University said, "Göbekli Tepe changes everything". If indeed the site was built by hunter-gatherers as some researchers believe then it would mean that the ability to erect monumental complexes was within the capacities of these sorts of groups, which would overturn previous assumptions. Some researchers believe that the construction of Göbekli Tepe may have contributed to the later development of urban civilization, or, as excavator Klaus Schmidt put it, "First came the temple, then the city." In addition to its large dimensions, the side-by-side existence of multiple pillar shrines makes the location unique. There are no comparable monumental complexes from its time. Since its discovery, however, surface surveys have shown that several hills in the greater area also have T-shaped stone pillars (e.g. Hamzan Tepe,, Karahan Tepe,, Harbetsuvan Tepesi, Sefer Tepe,, and Taslı Tepe,) but little excavation has been conducted. Most of these constructions seem to be smaller than Göbekli Tepe, and their placement evenly between contemporary settlements indicates that they were local social-ritual gathering places, with Göbekli Tepe perhaps as a regional centre. So far none of the smaller sites are so old as the lowest Level III of Göbekli Tepe, but contemporary with its younger Level II (mostly rectangular buildings, though Harbetsuvan is circular). This could indicate that this type of architecture and associated activities originated at Göbekli Tepe, and then spread to other sites. A site that is 500 years younger is Nevalı Çori, a Neolithic settlement. It was excavated by the German Archaeological Institute and has been submerged by the Atatürk Dam since 1992. Its T-shaped pillars are considerably smaller, and its rectangular ceremonial structure was located inside a village. The roughly contemporary architecture at Jericho is devoid of artistic merit or large-scale sculpture, and Çatalhöyük, perhaps the most famous Anatolian Neolithic village, is 2,000 years later. At present Göbekli Tepe appears to raise more questions for archaeology and prehistory than it answers. It remains unknown how a population large enough to construct, augment, and maintain such a substantial complex was mobilized and compensated or fed in the conditions of pre-sedentary society. Scholars have been unable to interpret the pictograms, and do not know what meaning the animal reliefs had for visitors to the site; the variety of fauna depicted, from lions and boars to birds and insects, makes any single explanation problematic. As there is little or no evidence of habitation, and many of the animals pictured are predators, the stones may have been intended to stave off evils through some form of magic representation. Alternatively, they could have served as totems. The assumption that the site was strictly cultic in purpose and not inhabited has been challenged as well by the suggestion that the structures served as large communal houses, "similar in some ways to the large plank houses of the Northwest Coast of North America with their impressive house posts and totem poles." It is not known why every few decades the existing pillars were buried to be replaced by new stones as part of a smaller, concentric ring inside the older one. Human burials may have occurred at the site. The reason the complex was carefully backfilled remains unexplained. Based on current evidence, it is difficult to deduce anything certain about the originating culture or the site's significance. Future plans include construction of a museum and converting the environs into an archaeological park, in the hope that this will help preserve the site in the state in which it was discovered. The conservation work caused controversy in 2018, when Çiğdem Köksal Schmidt, an archaeologist and widow of Klaus Schmidt, said the site was being damaged by the use of concrete and "heavy equipment" during the construction of a new walkway. The Ministry of Culture and Tourism responded that no concrete was used and that no damage had occurred. Nevalı Çori - a temple site thought to be very similar to Göbekli Tepe. ^ "Göbekli Tepe". Forvo Pronunciation Dictionary. ^ a b "History in the Remaking". Newsweek. 18 Feb 2010. ^ a b c d e f g h i Curry, Andrew (November 2008). "Göbekli Tepe: The World's First Temple?". Smithsonian Institution. Retrieved 2019-03-31. ^ Sagona, Claudia. The Archaeology of Malta. Cambridge University Press. p. 47. ISBN 9781107006690. Retrieved 25 November 2016. ^ Centre, UNESCO World Heritage. "Göbekli Tepe". whc.unesco.org. Retrieved 2018-07-01. ^ Schmidt, Klaus (2011). "Göbekli Tepe: A Neolithic Site in Southwestern Anatolia". In Steadman, Sharon R.; McMahon, Gregory. The Oxford Handbook of Ancient Anatolia. Oxford: Oxford University Press. p. 917. ISBN 9780195376142. ^ "Turkey's Ancient Sanctuary". The New Yorker. Retrieved 2017-08-26. ^ "World's Oldest Monument to Receive a Multi-Million Dollar Investment". HISTORY.com. Retrieved 2017-08-26. ^ "The CANEW Project". archive.org. 13 March 2009. ^ "Which came first, monumental building projects or farming?". Archaeo News. 14 December 2008. ^ Taracha, Piotr (2009). Religions of second millennium Anatolia. Eisenbrauns. p. 12. ISBN 978-3-447-05885-8. ^ Julia Gresky, Juliane Haelm and Lee Clare, "Modified human crania from Göbekli Tepe provide evidence for a new form of Neolithic skull cult", Science Advances, Vol. 3, no. 6, 28 Jun 2017. DOI:10.1126/sciadv.1700564 (full text). ^ Oliver, Dietrich (June 1, 2017). "Cooperative Action of Hunter-Gatherers in the Early Neolithic Near East. A View from Göbekli Tepe". ^ "Turkey: Archeological Dig Reshaping Human History". newsweek.com. 18 February 2010. ^ Çelik, Bahattin (2010). "Hamzan Tepe in the light of new finds". ^ Çelik, Bahattin (2011). "Karahan Tepe: a new cultural centre in the Urfa Area in Turkey". ^ Çelik, Bahattin. "A small-scale cult centre in Southeast Turkey: Harbetsuvan Tepesi". ^ Simmons, Alan H. "The Neolithic Revolution in the Near East: Transforming the Human Landscape". University of Arizona Press via Google Books. ^ "GHF - Göbekli Tepe - Turkey", globalheritagefund.org, web: GHF2 Archived 5 July 2011 at the Wayback Machine. ^ "Concrete poured on Turkish World Heritage site". Ahval. 21 March 2018. Retrieved 2018-03-26. ^ "Construction around site of Göbeklitepe stirs debate". Hürriyet Daily News. 21 March 2018. Retrieved 2018-03-26. J. Peters & K. Schmidt: "Animals in the symbolic world of Pre-Pottery Neolithic Göbekli Tepe, south-eastern Turkey: a preliminary assessment." Anthropozoologica 39.1 (2004), 179–218: https://web.archive.org/web/20110612061638/http://www.mnhn.fr/museum/front/medias/publication/10613_Peters.pdf. 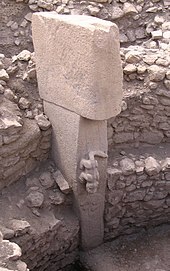 Wikimedia Commons has media related to Göbekli Tepe. Curry, Andrew (Nov 2008). "Gobekli Tepe: The World's First Temple?". Smithsonian Mag. Birch, Nicholas (23 April 2008). "7,000 years older than Stonehenge: the site that stunned archaeologists". The Guardian. Scham, Sandra (Nov 2008). "The World's First Temple". Archaeology magazine. Symmes, Patrick (Feb 18, 2010). "Turkey: Archeological Dig Reshaping Human History". Newsweek. Mann, Charles C. (June 2011). "The Birth of Religion". National Geographic. Batuman, Elif (Dec 19, 2011). "The Sanctuary". Dept of Archeology. The New Yorker. Andreit, Mihai (Sep 4, 2013). "World's oldest temple probably built to worship the dog star, Sirius". ZME Science. "The Birth of Religion". National Geographic. June 2011.